The school holidays have started and you'll want to make sure that the kids are entertained whatever the weather. We have a great range at Studio of both indoor toys and games and outdoor fun, so come rain or shine the kids should always have something to do. If it's sunny the garden is your oyster! Trampolines, pools, tents, swings, slides and bikes are only a few of the great outdoor toys we sell and are a fantastic idea for keeping the kids entertained this summer, and they'll get fresh air too. HOT BUY! These Ride On Electric Bikes are only £34.99 each*! 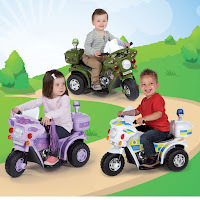 Available in Police Bike, Army Bike, and Princess Bike designs, with a 6V battery with reverse and forward gears, working headlights and flashing lights to rear with siren sounds too. These bikes will provide hours of fun this summer. If the weather is not so great... (did i hear someone say "typical British summer"?) 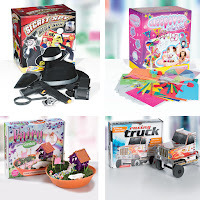 we've got a fab range of craft kits, dressing up sets, games and puzzles that will be sure to cheer up any dreary day. For the older kids we've got a great range of tablets, e-readers, laptops, games and games consoles. E-readers and tablets are great for keeping all the family entertained on long car journeys and trips away from home too.